Finding dress pants that check all the boxes can be difficult depending on the look you are going for and your body type. Men who are looking for a dress pant for work or other activities want styles that are comfortable and look good. 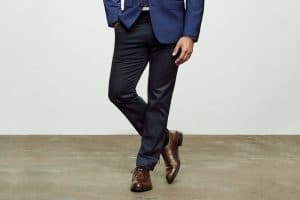 We have found the best brands for men’s pants that are not only comfortable but stylish and great for all different budgets, including many options that are under $100. From flat-front to classic, and cotton to wool, we have found the most pleasant to wear styles for everyone. A stylish option is the Bonobos Stretch Weekday Warrior Dress Pants. As you can probably tell from the name, they are a reasonably durable dress pant that is great for every day. They are particularly useful if you have to move around a lot since they have a little bit of stretch to them to make them more comfortable. The Weekday Warrior comes in 4 different fits: tailored, slim, straight, and athletic, so there is something for almost all body types. The fabric is somewhat lightweight so that it can work well in the warmer weather months. They wash and dry well and are no-iron so you can wear them right out of the dryer and they will still look great. It is a versatile design that can be dressed up or down, depending on the shoe and shirt you choose to wear it with. 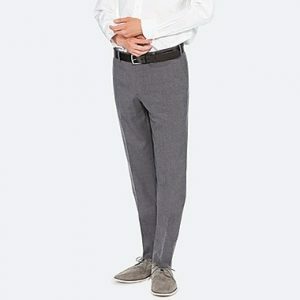 Generally, these pants are regarded as one of the very best options in men’s everyday dress pants due to the quality and comfort fit you are getting for a very reasonable price. 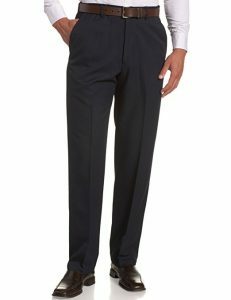 The Haggar Men’s Cool 18 Hidden Expandable-Waist Plain-Front Pant is very popular due to the expandable waist, cool-wear fabric, and the quality you are getting for the price. It is a good option if you like a looser, baggy fit, which can be a little hard to find among all the slim and skinny fits that are so popular these days. This Hagger style can be machine washed, which is a huge plus for a dress pant and they are no-iron. The length seems to be a little long for some people, but great if you are taller and have trouble finding a longer pant (they can always be hemmed if you see that they are too long for you). The expanding waistline helps make them very comfortable and ensures you get a great fit. They also have a band that makes sure your shirts stay tucked in. They look professional and classy, yet you can move around in them effortlessly since they are a looser design. If you follow the washing instructions and hang them to dry, you shouldn’t get any shrinking or fading, and they will last for quite some time. A beautiful, 100% wool style that is made in Italy is the Santorelli Luxury Flat Front Wool Trousers. They have a rubber grip on the inside of the waist to stop your shirt slipping out and giving you an untucked look. This design is also lined to the knees, so they will be super comfy. Since they are wool, they will have to be dry cleaned, but this will help make them last for years. They are a mid-rise style made from luxurious wool that drapes well, and they are a classic fit so you can move in them comfortably. The wool does have a slightly lighter weight than some traditional wool trousers, but they can be worn almost year-round in many climates. If you get them at Nordstrom, you can have them tailored for no extra charge. 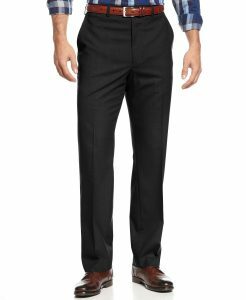 The Van Heusen Men’s Flex Straight Fit Flat Front Pant is a great style if you like to keep a polished look throughout the day. 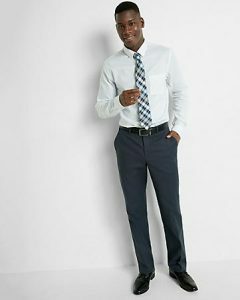 The key features that keep you looking great are the shirt-gripper around the waistband and the no-iron poly blend fabric that keep you wrinkle free and tucked in. Despite being polyester, the material is soft to the touch, and it has a little bit of stretch to it, so it is made to move with you. A couple of other features to note about this style include a comfortable stretch waistband, straight leg design and they are machine washable. They are considered a solid, budget option that can be worn in most workplaces that will look good on a lot of different body types. A lot of men are huge fans of Ted Baker’s wool trousers. They have a slightly lower rise than most designer classic wool trousers and are tailored around the calf with a tapered leg, so they look modern and stylish. They have a partial lining and are made with high-quality, comfortable, wool fabric. The fit is slim, but not too skinny, and it leaves a little bit of room in the thigh and the seat area, so they are comfy if you spend large parts of your day sitting. The overall look of the pant is perfect for an upscale office environment. It is another brand that is expensive, but most Ted Baker shoppers find that the quality and design are well worth it. Uniqlo is a reliable place to get inexpensive, yet decent quality men’s wear. Their dress pants are modern and stylish to boot. 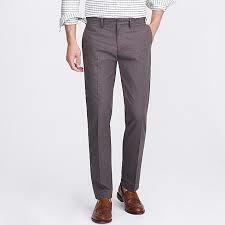 Of all the dress pant budget options, Uniqlo’s pants are often considered the best due to the quality that you are getting. You will need to have them hemmed, which is free in store, as they only come in 34″ inseam. Like many other styles on this list, they are pretty much wrinkle resistant and iron-free. Another option you may want to check out if you are on a tight budget is some of the Express dress pants. If you get them on sale, you can get some great pants for sometimes as low as $35, or they often do buy one get one free deal. Express pants tend to be pretty comfortable, while still looking professional and sleek for work. They offer four different fits and come in a wide variety of colors. Some of their designs are a cotton spandex blend, so they have a little bit of stretch and can be machine washed. 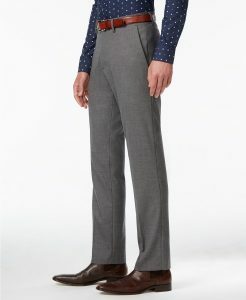 Club Monaco is another slightly more upscale brand that usually has good quality, modern designs to their dress pant. Some of their pants are very stylish, and they come in slightly different cuts and in interesting textured fabrics that are a little more unique. 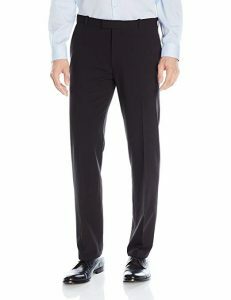 The Kenneth Cole Reaction Men’s Slim-Fit Stretch Dress Pants that you can find at Macy’s are a great option if you are new to dress pants and want something stylish and sleek. They are easy care, so you can machine wash them, and they shouldn’t need much ironing to keep them looking great. They are a slim fit, made with a slightly stretchy polyester spandex blend. It is a good design if you are trim and like your pants a little fitted. 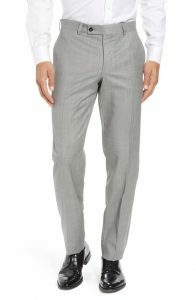 For the price you are paying, Kenneth Cole pants are pretty good quality and are quite stylish. They also come in a wide range of sizing and can be a great fit on men who are slim and with long legs who may have trouble finding dress pants that fit well. Another luxury option that is known for its premium comfort and high-quality artistry are from Italian brand Zanella. They have many different dress pant styles, with one of their best being the Zanella Devon Flat Front Solid Wool Serge Trousers. This 100 % wool design has a sharp flat-front cut, as well as the standard fly with hook-and-bar and button-tab closure. It also has the slant and back button-closure welt pockets. They come unhemmed, so you will need to get them altered, which is a little bit of a hassle but it means that you will get a great fit and they will be tailored perfectly for your body. Also if you get them at Nordstrom, they will alter them for free. One luxury feature of this style is that it is lined to the knee, so that help to add to the comfort level. They are quite pricey, but they are very high quality and should last for years. 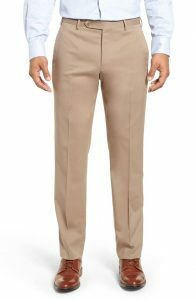 These flat front dress pants from Michael Kors are an excellent option if you are looking for an alternative to the slim fit designs while still looking stylish and polished. They are a classic fit, so you get a little more room to move around, and they are a bit more forgiving if you have areas that you would prefer not to draw attention to. This design is a polyester blend with a touch of spandex for a little bit of stretch. They are easy care, so they can be machine washed and don’t need to be ironed. They probably aren’t worth buying at full price, so wait for a sale, and you can get a pretty good discount making the pant quite a good deal for the quality you are getting. The fabric has a very slight, silky finish to it that makes them look a little bit more dressy than some other options out there. Since they are a poly blend, you don’t need to worry about this style getting wrinkled easily, and they seem to be pretty durable so you should be able to get many years out of this pant. 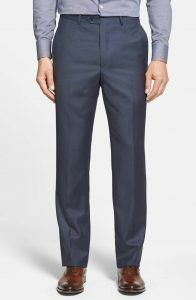 Banana Republic is the go-to place for many men for dress pants. They have a lot of different styles, fits and fabric options to choose from that are good quality and look modern and stylish. They can be somewhat pricey, so it is best to wait for them to go on sale, you shouldn’t have to wait too long they do go on sale pretty frequently. The most popular of the BA styles tend to be the slim fit, non-iron options. 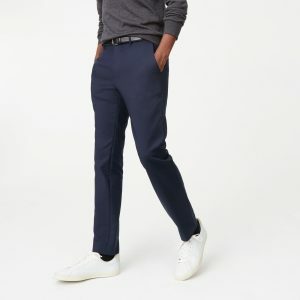 J Crew is another trendy brand for their slim fit dress pants; in particular, the Ludlow Slim-fit Unstructured Suit Pant is a beautiful dress pant that looks great especially if you are tall and trim and like a modern cut. Depending on the time of year, this style is offered in different fabrics types. They are not cheap, so if you are looking for a more affordable J Crew option, you could always check out J Crew Factory. They offer a pant called the Bedford Flex Dress Chino that is a more casual, although still dressy, alternative that is usually reasonably priced. You may also want to have a look at some of the suit dress pants that are a little more dressy and a little more pricey. Since you can always get pants hemmed, it is best to look for pants that fit your waist and length well and then have the pants tailored. A good tailoring job can make a huge difference in how good the pants look on you. Some stores like Nordstrom, Club Monaco, Uniqlo, Banana Republic, and J Crew offer to tailor pants as part of their services. These tailoring services often have restrictions, like the pants have to be bought when full priced or cost over a certain amount. A lot of the higher end dress pants have to be dry cleaned. If this isn’t your thing and you would prefer options that are machine washable, there are a decent amount of styles out there. Just make sure you check before you buy the pant whether it is machine washable or not.